A gorgeous Georgian style home with all modern comforts. I received the warmest homely welcome, and breakfasts were a treat. James is extremely knowledgeable about the area and its history;chat to him or book one of his tours. Tucked away in a quiet area, but an easy walk to the food hub. Owner James Calderwood, offers a warm welcome to Maison Chablis Guest House, a Georgian style Guest House, set behind white-washed walls in a secluded garden in Franschhoek in the Cape Winelands. 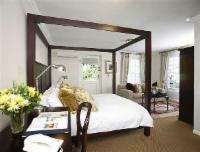 Stylishly decorated, quality air-conditioned bedrooms offer all luxury comforts. Breakfast at leisure then soak up the sun at the sparkling pool set in a secluded garden. A two-minute stroll from the historic Franschhoek village centre with its charming street cafés, award-winning restaurants, museums and galleries, and within easy reach of many wine estates. 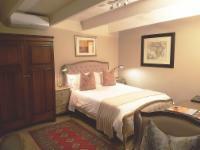 "Our stay at Maison Chablis was wonderful. James was extremely welcoming and informative. The house, grounds, and our room were peaceful and beautiful. Breakfast was delicious. We would definitely stay again!" "I can confirm that our guests really enjoyed their stay at Maison Chablis and would return. James was a great help and the service was first class." "The stay during 7th to 12th March 2015 was excellent and the management of the establishment exceeded our expectations and we can only give excellent recommendations for any one else wishing to stay there. We would have no hesitations on returning and it would certainly be our first choice." 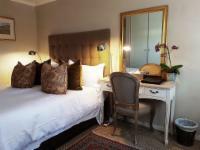 "Beautiful accommodation in the heart of the Franschoek village. We would recommend this to anyone." "Very well located, quite and a very good breakfast. Exellent golf course in Pearl Valley not too far away. A must for golfer!" "A lovely property near to restaurants, nicely appointed and with the very attentive and helpful James, the host with the most! I cannot find fault with this one!" "I enjoyed a warm welcome, gracious hospitality and an extremely comfortable stay at Maison Chablis. Nothing was too much trouble for my host, James, and his staff, and my time in Franschhoek was a delight - I can highly recommend a visit to Maison Chablis!!" "We really enjoyed our stay , it was really good. Lovely breakfast ,attention to detail . Really friendly staff and beautiful. So great to just walk up the road to all the shops and not have to worry about parking." 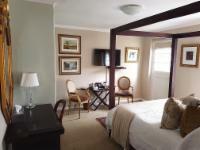 "Just the perfect place for a stay in Franschhoek if you want to stay in town instead of at a pricey and isolated winery. You can walk the whole town. There are lots of great restaurants so you can walk to any of them, have some great wine and get back without worrying about drinking and driving. The building (a made-over house) and parking lot are protected by an automatic gate. The place is small, homey, cute (romantic...) with an inviting swimming pool and pleasant garden. Alas, we were there in early Sept., too early to use the pool. Innkeeper, James, is ever so helpful and is always on-site. Breakfast (hot and cold) is in a lovely upstairs room with lots of birds in the trees near the windows tweeting happily. There are adequate electrical plugs, both South African (extra adaptor provided in case you need one) and European. We stayed in a standard room, smallish, but quite comfortable with adequate bathroom and closet space (with a safe). We would stay here again for sure and will recommend it to all our friends. Keep up the good work, James. Sorry we missed Pat." "Great place. James is the key because he has good people skills and takes a lot of care"
"A pretty guesthouse perfectly located for all the local restuarants and the wineries in the valley. A lovely secluded pool is set at the side of the house. 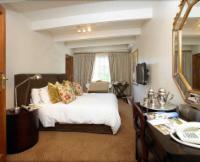 The room was spacious, nicely furnished with thoughtful tea and coffee making facilities. The bed was really comfortable. The staff were friendly and helpful.James (the owner) was charming with lots of local knowledge and advice. If you like dogs he has a fabulously friendly and podgy Jack Russell who will only bother you if he gets attention - which we happily provided." "Highly recommended - spent 2 nights and regret that it was not longer. A perrfect base from which to experience the delights (particularly food and wine) of Franschhoek. 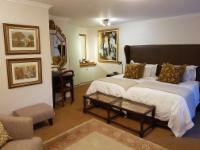 James, Pat and the staff were very helpful, kind and attentive thrioughout our stay." "This is a delightful guest house that ticked most of the boxes we always require. We received a very warm welcome from James the new owner on arrival & were quickly shown to our spotlessly clean room. Our large downstairs bedroom & adjacent bathroom had its own little courtyard where we drank a glass or two from the bottle of very chilled local wine James had arranged for us on the first evening. The following day we enjoyed an excellent breakfast prepared & served by the charming staff in the dining area upstairs. We parked our car in a secure area adjacent to our room because the property benefits from security gates. Our afternoons were spent sunbathing on comfortable sun beds beside the swimming pool partly shaded by trees. The property had excellent air conditioning & free Wi-Fi & was conveniently only a short walk from the many restaurants & shops. 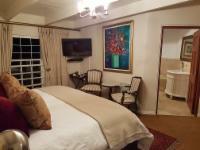 We would certainly stay in this guest house on our next visit to Franschhoek." "My time in Maison Chablis was excellent. The person in charge of the place - James - is a very friendly and obliging guy. Always available to assist during your stay. Breakfast is very rich. Wide range of choice. The room was very tidy and clean. No noise as the B&B is far enough from the main road. Parking inside is also not a problem at all. I would strongly recommend the place if you are to spend a few days in this town." Travel into Franschhoek in the direction of the Hugenot Monument. Second last road to the right into Berg street and Maison Chablis is on the left hand side of the road, second block down. S33° 54' 48.85" E19° 07' 11.84"